ROME – The financing agreement for a 101 million dollar project that aims to improve the living conditions and climate resilience of rural populations in five provinces of Burundi was signed Wednesday in the Eternal City. The Agricultural Production Intensification and Vulnerability Reduction Project (PIPARV-B), which will benefit nearly 235,000 vulnerable households, was signed by Gilbert F. Houngbo, President of the International Fund for Agricultural Development (IFAD), and Domitien Ndihokubwayo, Minister of Finance, Budget and Economic Cooperation of the Republic of Burundi. The new project will target the provinces of Gitega, Karuzi, Kayanza, Muyinga and Ngozi, where population and malnutrition rates are among the highest in the country. The financing for the project includes a 27.5 million dollar grant from IFAD. 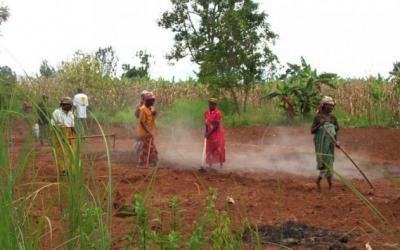 In Burundi, one of the main causes of poverty is the poor performance of the agriculture sector, which suffers from low public and private investment, overexploitation of natural resources and vulnerability to climate change, as well as soil degradation, disease and barriers to market access. PIPARV-B aims to reduce chronic child malnutrition and improve nutrition rates overall in the project areas by training household members on good dietary practices, nutrition and hygiene. Through the organisation of 20 cooperative groups, it is expected that 6,000 participants will have access to climate-resilient technologies, including high-quality seeds and plants, as well as storage, processing and marketing facilities for rice and milk. The project will also promote the raising of small livestock, fishing, poultry farming and beekeeping. The project will establish 240 farmer field schools in developed wetland areas, while supporting 30 wetland users' associations and 333 watershed committees. It will train 3,000 young men and women. Furthermore, PIPARV-B is expected to rehabilitate 150 kilometres of rural roads to facilitate market access and construct 30 rice storage hangars equipped with hulling and whiting machines. Since 1980, IFAD has financed 13 rural development programmes and projects in Burundi which have directly benefited 947,779 rural households.